By Jeff Z. KleinAt Iroquois Lacrosse Arena in Hagersville, Ontario, the home of the Six Nations Chiefs, box lacrosse champions of eastern Canada, a photograph from 1931 hangs on the wall. Gazing ahead resolutely and gripping a lacrosse stick is a handsome dark-haired Mohawk man with a bandage over his right brow. How Smith, a lacrosse star of the Six Nations of the Grand River, became Silverheels, an actor who despised his own portrayal of an Indian, is a story that spans a continent and an era. 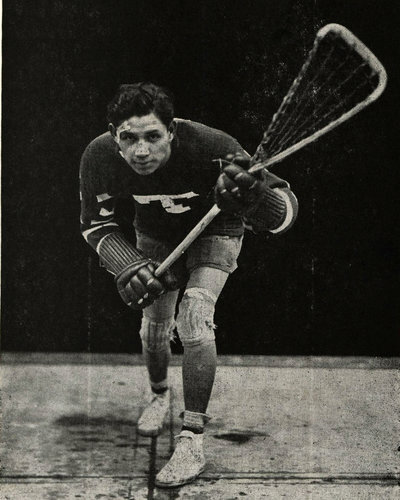 But few realize that what put him on the path to Hollywood was the invention of indoor lacrosse—box lacrosse, as it is called in Canada and western New York. “He would never have been discovered, never have become Tonto, if he hadn’t been in L.A. to play box lacrosse,” said the historian Larry Power, compiler of the Internet archive Bible of Lacrosse.Comment: For more on Tonto, see New Tonto as Racist as Old Tonto and Best of the Lone Ranger Reviewed.